Needless to say, my fasting BGL was 361 this morning, so I definitely dosed myself with Novalog. But I am still amazed at the 228 pounds since I’ve been pretty stalled at over 230 pounds for a while. Maybe my body needed a binge day. I had set my next weight goal at 220 and it had looked very bleak at reaching that number for a month and a half now. But today is a full fasting day for me and I’m assuming tomorrow’s number on the scale will be less that 228.4. Maybe I’m going to reach 220 after all. I’m going to drink lots of water to help my body purge toxins today. This past month was a very non-typical one for me and my husband and my entire family. 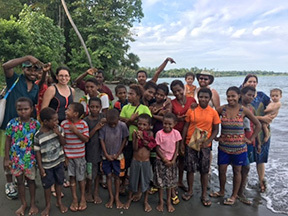 Three weeks ago, my missionary daughter FaceTTimed us from Ukarumpka in Papua New Guinea where she and my SIL serve as Wycliffe Bible translators. A few days before, they had finished their 3-month jungle orientation training which culminated with a 4-week emersion into village life. She, her husband and her two young boys spent a full month living without any modern conveniences in a native PNG village. 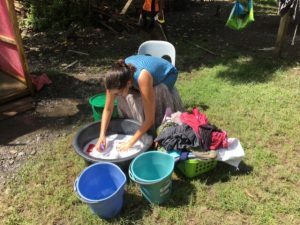 The training had gone well and they were very happy with their wonderful “wasfamily” (the host family who helped them and who allowed them to live in their homes). Their wasfamil included wassisters and brothers and all the wasfamily’s extented adult childrenas well as all their children. They had their own house as part of the wasfamilies’ and prepared meals and ate with the family and helped with many of the daily living tasks. Basically, the family showed them how to become part of the PGN culture and how to act properly with villagers and practice the Tok Pisn language. Image of Jason with speargun WasPapa made for him. Jason had become such good friends with the waspapa (the patriarch father of the family) that waspapa told Jason he considered him “his firstborn son”. This was a great honor to Jason and basically means, the family would do anything to help Jason – including selling all its property and giving him financial aid and helping them in basically any way possible. I had prayed for God to send Jennifer and Jason and the boys awesome friends and a family to take the place of those they left behind in the US. God provides so well. That is why Jason and Jennifer have yet to tell their waspapa what happened to Jennifer after leaving the village and going to live in Ukarumpa. Jennifer looked very wan and pale and weak on that FaceTime call and she told me the clinic in Ukarumpa had decided to med-flight her out of PNG to a hospital in Australia since she was not getting better. She had been in the Ukarumpa clinic for 4 days receiving IV fluids and help with an illness that had shown up the weekend before. She had a high fever, diarrhea, and vomiting and couldn’t eat. Her blood pressure was at 60/20 and her lungs were filling with fluid, causing her heart rate to skyrocket to over 140 a minute. She gained over 30 pounds in extra fluid through her body. They had decided they had done all they could to possibly help her and she need more than they could provide in the clinic. She wanted to tell me herself so I wouldn’t learn about it on a FaceBook post. My only child was a very sick young lady. Mel and I had begun praying for her as soon as we heard about her sickness a few days before and this news devastated us. We had feared for her and her family, that they might pick up some dread disease during their mission work and now, this was happening. I immediately began calling my family and friends to ask for fervent prayer for her and decided that I would begin a spiritual fast and fast until she was better. This was early on a Tuesday morning during the night (Ukarumpa is 13 hours ahead of us in time) and Jennifer would be flown out as soon as it was daylight there – a several hour wait. In addition, a trip to the hospital in Cairn’s (pronounced “Cans”) Australia was about a 5-hour flight. I worried about that length of time and prayed she would be ok until she got to the hospital in Cairns. Mel and I had a decision to make. What should we do? 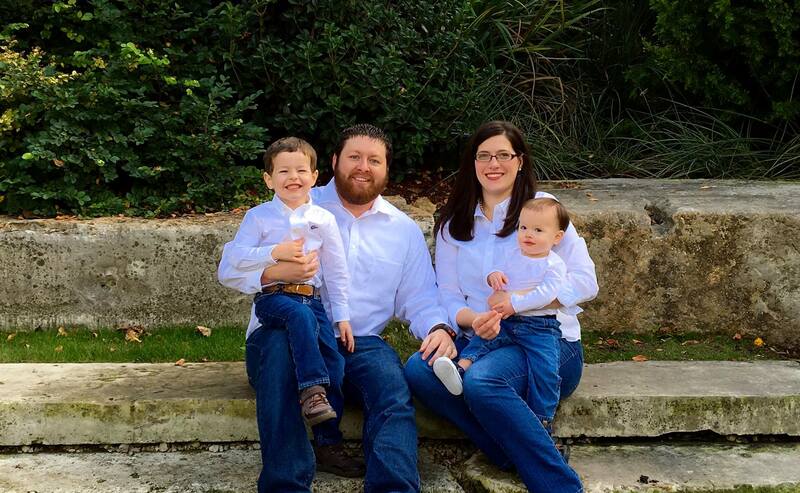 Jennifer was thousands of miles away with a yet undiagnosed illness and was being med-flighted to be placed in an ICU. My son-in-law advised us to decide for ourselves and he was obviously very scared for Jennifer. We were too. Neither of us had our passports and we would need them plus visas to enter Austrailia. We would need tickets and we would need them soon. The travel time would take us about two days to reach Cairns. We decided that we wanted to be there with her, and started making arrangements. Mel wondered if I would be able to make it, but no way would I not be going to the side of my critically ill daughter. My sister, Vicky, who thinks of Jennifer like her own daughter, wanted to go also. 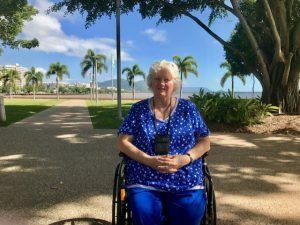 We searched online for flights that would get us to Cairns the soonest, which would be leaving on Saturday morning from Little Rock, Arkansas and arriving in Cairns’ on their Monday around noon. The Flights would include a 1.5-hour flight from LIT to DFW (Dallas), a long wait in Dallas and then a 16-hour flight to Sydney, Austrailia, with another long layover in Sydney and then a 5-hour flight to Cairns. That 16-hour flight was one of the longest flights in the world. In addition, Mel and I would have to travel 4 hours from our home in Bella Vista, Arkansas to Little Rock to the vital records office to get my official birth certificate which I did not have. Then we would need to take it with other paperwork to the Passport Office in Hot Springs, Arkansas to request a “rushed passport”. We booked flights for 3 people and set a 8:30 am meeting on Friday morning at the Hot Springs Passport Office and proceeded to pack and make sure we had enough of our prescription meds to last a couple of weeks. That’s another story, but I did end up paying $400 extra dollars to get one of my meds refilled locally – outside of our insurance. I knew that I would have to be taking my blood thinner during all those flights. We had to consider what to do with our 130 pound Giant Schnauzer dog, Boaz while we were gone. It’s not like you can ask a friend to watch a huge animal like him – even though he is very friendly – but he sometimes has issues with inflammatory bowels and we couldn’t ask anyone to deal with that. Mel went to the vet/kennel we use here in Bella Vista. 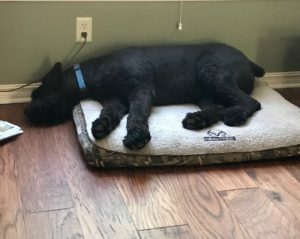 They are great – they love Boaz, and the guy in charge at the kennel listened to our story and told us, that while he wouldn’t have one of the large runs available until mid-week the next week, he would work out something for us and care for Bo as long as we needed. Thank you, Jesus. That was solved. We went to CVS to get our photos made and the awesome young lady there did it free of charge for us. She had seen my request for prayer for my daughter on Facebook the night before and wanted to help us. (Bless her!) We then took the paperwork we had to the circuit clerk’s office here to see our filled out passport applications to make sure we had everything correct. The awesome lady who helped us there checked them out and told me the copies of my birth certificate were not official ones and I would need to get official ones from the vital records office in Little Rock. She also asked for my daughters’ name, so she could pray for her. What a wonderful lady! We asked our lovely neighbor, Ms. Lenore to watch our house and get our mail and newspaper for us and she agreed. We went to CVS to get our photos made and the awesome young lady there did it free of charge for us. She had seen my request for prayer for my daughter on Facebook the night before and wanted to help us. (Bless her!) We then took the paperwork we had to the circuit clerk’s office here to see our filled out passport applications to make sure we had everything correct. The awesome lady who helped us there checked them out and told me the copies of my birth certificate were not official ones and I would need to get official ones from the vital records office in Little Rock. She also asked for my daughters’ name, so she could pray for her. What a wonderful lady! We asked our lovely neighbor, Ms. Lenore to watch our house and get our mail and newspaper for us and she agreed. Then there was a hiccup. I got an email saying our payment for the flights had been declined on our cc, we had exceeded our limit for the month. My husband, Mel, had retired from working at the bank we got our cc from and luckily, we were able to go to the local Simmons bank and talk with a lady there and call someone he knew at the main bank to get our limit raised significantly to cover the cost of the flights. This was definitely a God thing. A normal bank customer would not have been able to get this done without a 2-week wait. On Wednesday we left our home in Bella Vista, dropped Bo off at the vet/kennel and headed to my younger sister’s home in White Hall. That was a 5-6 hour drive for us. We spent the evening with my sister, Sandy, who was also very concerned about Jennifer. Thursday morning, we drove to the vital records office in Little Rock and requested and received my official birth certificate copy. This took about 3.5 hours. We returned to spend another evening at Sandy’s and headed out very early Friday morning for the 2.5-hour drive to make our 8:30 appointment at the Passport Office in Hot Springs. This was an interesting experience. Mel rolled me and my wheelchair up to the office door and they would not even let us in without the confirmation number for our appointment. Once we were in, there was me in my wheelchair, Mel and 3 security officers and lots of scanning equipment; t was crowded. It was just like going through TSA at an airport. We made it through that security and were put in a room where a lady looked over our application and backup documents and we paid the fee (over $90 each) and were told to go away and they would call us when our passports were ready to be picked up. They would be ready by 2:30 pm or possibly earlier. It was almost lunch time, so we left and went to Wendys in Hot Springs which had a wi-fi and began working on our online Visa Applications to get into Australia. I was still fasting, so I got an unsweetened tea. This took us hours to get done and we messed up and ended up paying not only $80 each but an extra $80 when we messed up one of the applications and had to start over. The passport office called us before 2:30 and we returned to get them. I stayed in the car while Mel went through the security again to pick them up. So we headed back to my sister, Sandy’s home. Our flight out would be in the morning and we would need to get there a couple of hours early of course. That evening, we had another hiccup, I received yet another email from FlightHub that we owned for our flights. Mel called their support desk and talked with a couple of reps and found out their system had made a record-keeping error and their system was creating our problems. This was fixed and I finally received an email with our ticket confirmation numbers. That evening I was finally able to concentrate on thinking about Jennifer and we all prayed for her again. At this point, there were thousands of people praying for my daughter – from different churches our families and friends belonged to and including many wonderful Facebook friends many of us had. Of course, the Wycliffe communities were praying for her also. 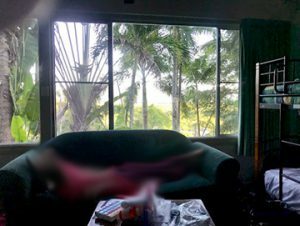 She had arrived at the Cairns Hospital and was admitted to the ICU. They began treating her with a broad spectrum of antibiotics since there was not yet a specific diagnosis of her infection. She was receiving supplemental oxygen and fluids and an infectious disease specialist was treating her. Several blood tests were being made to try to determine what specifically was the bacteria she had picked up. They had begun ruling out many things, like malaria, typhoid, and other tropical illnesses, but sill no definite diagnosis. A CT scan had revealed lots of fluid in both lungs and that she had blood clots also in her lungs, so she was placed on a blood thinner to help dissolve the clots. 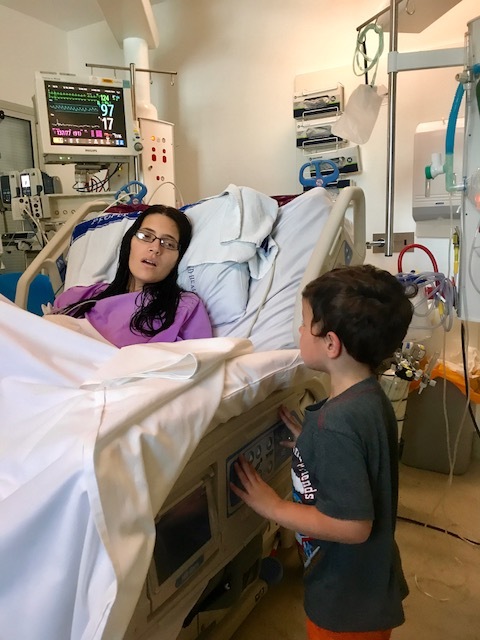 Her fever would keep coming back and her breathing was heavy and she struggled with each breath, so her heart rate stayed at an alarming 130+. Jason told us they were considering putting her on a ventilator to give her body a rest. The thought of my baby hooked up to a ventilator was so scary. All of us prayed so hard that she would improve and not need this. She was very critically ill but was now in a great hospital with state-of-the-art medical facilities and staff. 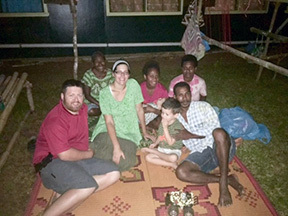 She and Jason had left their two boys, Josiah and little Isaiah behind in Ukarumpa with a couple of wonderful Wycliffe missionary moms watching over them. 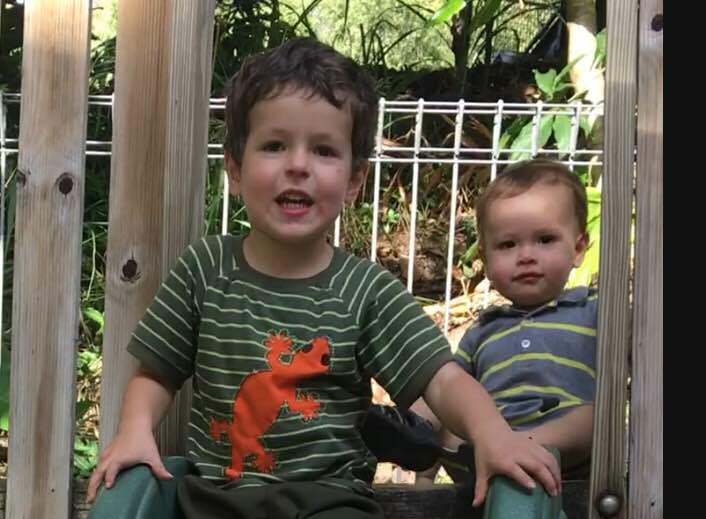 Josiah is 4.5 years old and Isaiah is 9 months. Jennifer and Jason both were missing those boys alot. Jennifer had not been able to hold them at all since she got sick, to ensure they didn’t get some thing from her. On Saturday morning, I got up very early and my brother in law, Gene (Vicky’s husband) drove us to the airport in Little Rock to catch our first flight. We decided to check my wheelchair with our larger luggage. So I got to use one of the airlines chairs with a great airline helper. That day would be the first time I had ever been out of the good ole USA. I had flown many times but never out of the country. I had even flown since I’ve been in this wheelchair and one nice thing about it, was most of the time we got sent to the front of the line – yeah!. The flight to Dallas was a short one and we were hardly up before we were landing again. I was still fasting so I only had water when it was offered. As many of you already know, Dallas is a large airport. The Airlines (American Eagle) had a helper with a wheelchair waiting as we got off the plane. He took us through to our gate and we waited for our long flight to Sydney. We had a longer layover here (from 12:00 until 10 pm that night), so everyone but me got a snack near our gate. Finally, we boarded the giant Qantas Airbus (it holds 400 passengers). Definitely the largest plane I’ve ever been on. We were flying economy class and the seats were not too large, with little legroom. I sat on the aisle seat so I could occasionally stretch my legs out some. At this point, I was so glad I had lost those 60 pounds the last couple of years and that I definitely wanted to lose even more before I planned another long trip. I fit okay into the seat. My sis, Vicky was in the middle seat and she eventually moved to a bulkhead seat for most of the flight. I watched 3 movies and turned down 2 awesome looking meals, getting only water. Qantas actually had wonderful meals on this flight. I did regret my fast a couple of times. But I had determined to fast and pray until Jennifer showed improvements. I was not able to sleep because I was too wound up and worried. That flight seemed to last forever and it actually did. I remember checking the flight status on the little monitor and seeing it was only10 hours into the flight. What a Bummer! Six more hours and we were totally over the ocean. I tried to watch another movie “Hacksaw Ridge” but couldn’t concentrate so I just sat there. I went and sat with Vicky for a while and we talked some and worried together about Jennifer. We were so afraid she was not going to recover. In my heart, I knew I had to keep from thinking like this and “give her to our loving Lord, yet again”. Ever since she and Jason had determined almost 3 years ago, they were called to the mission field and through Wycliffe to be Bible Translators, I’ve learned to give her over and over to our God. This time it was just a little more difficult. I was not able to sleep because I was too wound up and worried. That flight seemed to last forever and it actually did pretty much. I remember checking the flight status on the little monitor and seeing it was only10 hours into the flight. What a Bummer! Six more hours and we were totally over the ocean. I tried to watch another movie “Hacksaw Ridge” but couldn’t concentrate so I just sat there. I went and sat with Vicky for a while and we talked some and worried together about Jennifer. We were so afraid she was not going to recover. In my heart, I knew I had to keep from thinking like this and “give her to our loving Lord, yet again”. Ever since she and Jason had determined almost 3 years ago, they were called to the mission field and through Wycliffe to be Bible Translators, I’ve learned to give her over and over to our God. This time it was just a little more difficult. Finally, we landed in Sydney around 8:00 am their time and began the process of collecting all our luggage, even the checked ones, and my wheelchair so we could go through customs. We had been worried about this from stories Jason and Jennifer had related about their own experiences in the Syndey airport and customs. I and friends of mine had prayed for a smooth process, so why would I be surprised that God sent an angel to bring me a wheelchair and guide us expertly through the entire confusing process. We had only two hours before our flight to Cairns left at 10 am and not even enough time to make a pit stop at the restroom before we needed to find our gate and check our bags again and go through the customs process. This friendly Aussie helper took us under his wing and quickly led us precisely to each point we needed to go to get our luggage, through security and customs and to check our luggage and my wheelchair back in – all the way to the boarding gate for our next flight. Plus he had a wonderful accent that was a delight to hear and knew everyone at all the points, getting us through quickly. We would never have been able to do that by ourselves. Thank You God and thank you all the friends who prayed for us. I really believe this was an Angel in disguise. This friendly Aussie helper took us under his wing and quickly led us precisely to each point we needed to go to get our luggage, through security and customs and to check our luggage and my wheelchair back in – all the way to the boarding gate for our next flight. Plus he had a wonderful accent that was a delight to hear and knew everyone at all the points, getting us through quickly. We would never have been able to do that by ourselves. Thank You God and thank you all the friends who prayed for us. We arrived in Cairns close to lunch time on Monday, Austraila time. Jason was at the hospital with Jennifer and we told him we would meet him there. Mel called a cab which took us to the Cairns Base Hospital. I was startled to see cars on the “wrong side of the road” so I kept my eyes down a lot so I would not be gasping and scaring my fellow riders. The taxi took us to the TreeTops Lodge and we checked in and dropped off our luggage (This is a lodge jointly run by Mission Aviation and Wycliffe which offers economic prices to Wycliffe missionaries and their families). The view was so tropical and the weather wonderful. Actually, we didn’t get to see much of Cairns except this view, the places we ate and the hospital along with airports the entire time we were there. One day we will return for a real sightseeing vacation. Australia is one of the places I’ve always wanted to visit. Then we called an Uber driver to take us to the airport. Jason had described this service and walked Mel through the process of downloading the app and setting it up. I had heard of the Uber service but never used it. We were to become very familiar with Uber before our return home. Finally, we got to the hospital and located the ICU waiting room. We were all allowed to go visit Jennifer for a few minutes. She was, of course, hooked up to multiple IV’s, oxygen, had a pic line into her chest and we were asked to put on protective gowns and gloves because she was not yet diagnosed. I had never seen my baby so sick. So glad we came. She is very sick and it’s hard to know, that but if our presence helps in any way, I’m glad. She will have a long recovery and is still not out of the woods. 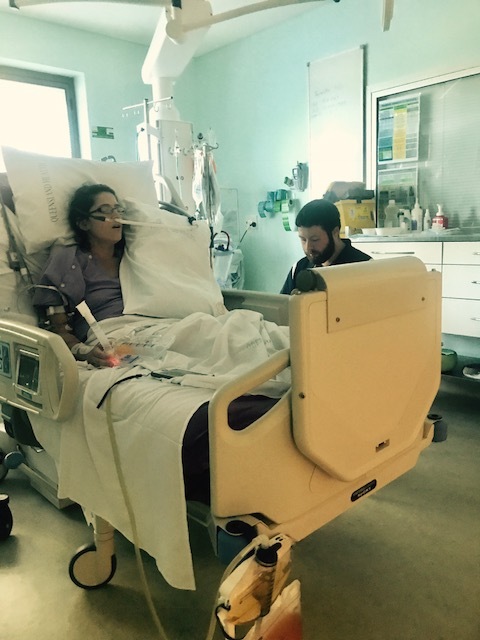 We made it to Cairns, Australia and were able to visit Jennifer in the ICU Yesterday. Of course, she looked beautiful to me. But she is a very sick young lady. It is so hard to watch her breathing so fast and her struggle to cough, which causes her pain. She had so many needles and lines in her arms. She has a pick line and an oxygen tube. She is extremely weak, out of breath when she talks and has little energy. My mother’s heart breaks to see her like this. Please pray especially for God to heal her lungs, both of which are half filled with fluid. Pray she will not need to be ventilated. Pray the antibiotics continue to take care of the infection in her body. Pray they will get a definite diagnosis (which they still haven’t confirmed). Pray for her spirit to be comforted and strengthened to deal with the spiritual warfare involved. Pray for Jason as he is here with her to have the strength and wisdom to do what he needs and feels Gods presence and guidance. Thank you for all your prayers, they have made a difference. Most of our time was spent in the ICU, however, we did leave to have lunch and dinner. For the first few days, I was able to choose salads from the two small dining places right outside the hospital. These were “Caesar Salads”. In Austrailia, or at least there in Cairn’s the Caesar salads had eggs in them and were more like our own chef salads. I was able to enjoy these several times during the first few days. I would usually skip breakfast like I normally do and only eat a salad for lunch and another one for dinner. There were other things pretty different from the US. Not, the least was the driving on the other side of the road, which really threw me. 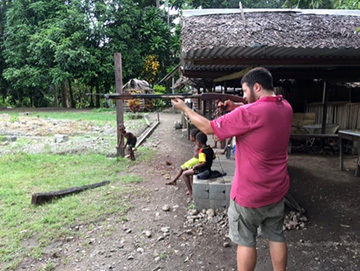 My son-in-law learned how and he did well, but I don’t believe I would want to try that for a long time. A common phrase I heard was “no worries”. Jason learned to say that also and it became part of his regular talking. All the Exit signs said “Way Out” instead of “Exit”. The “Yield” Signs along the road said “Give Way” instead. I really enjoyed meeting the Australian people and hearing them talk. Most of them sounded like “Crocodile Dundee” and it was pretty cool. I’m sure they found our accents pretty different also. I learned that Cairns is pronounced without the “rrr” sound and it sounds like “Cans”. When we began walking or taking an Uber ride downtown to eat, I found I had a hard time choosing just a salad. There was this one area full of sidewalk cafes and eating places. In fact, most of the dining places offered outside seating. We would choose the outside tables because it was so pleasant to be outside. So I decided to try some Aussie food. I had some cool meat pies at a place called “Pie Face” and I would choose the pie with lamb in it. There were also places with stuffed wraps and fries (except fries are called “Chips”) in Australia. Yes, I broke my low carb eating to eat this “chips”. I also learned that they rarely serve bacon as we know bacon. It is more like Canadian bacon strips or rounds. I was really glad to get home and fix Mel and I a “breakfast for lunch” with real bacon and eggs. I even ate some awesome Gelato a couple of times. I didn’t try kangaroo, but one day I will when I return to Austrailia. We arrived on a Monday and our flights out were on a Tuesday the following week. It was hard to leave all my babies. At that time, Jason had chosen to have the boys flown over from Papua New Guinea(a wonderful Wycliffe mom flew with them) and we got to see the boys some before we left. Little Josiah had been so worried about his mom and he was allowed in once to see her in the ICU. Jennifer took the oxygen tube off when he visited and he stood by her bed and in a small voice asked “mama, do you feel better?”. It almost broke my heart. The boys stayed mostly at the Treetops Lodge; and Jason’s mom, Cindy had flown over to keep them until Jennifer was out of the hospital. Vicky helped her some while we were still there. I was so glad Cindy was going to stay longer than we were. Jennifer was finally getting better, but slowly. The day we were to fly out at 6 pm that evening, we visited her for the last time. She was definitely on the mend and had been moved to a regular room at last. The docs had finally settled that she was struck by an infection that turned septic was is called “scrub typhus”. Probably gotten from a mite bite she had while in the village. 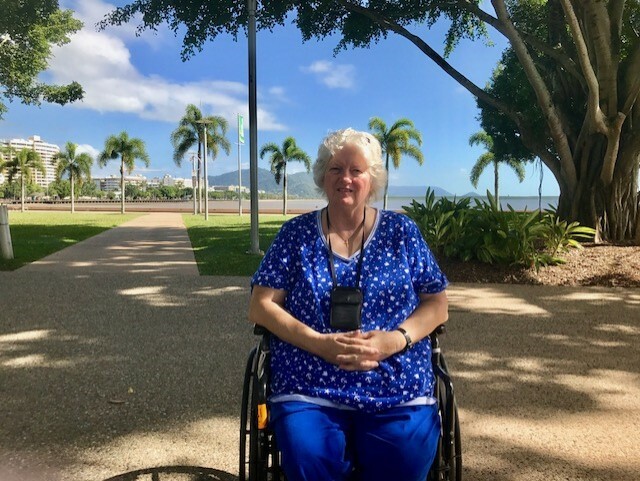 After we were back in the states, she was let out of the hospital and will stay in Cairns for another month at least or until her lungs heal enough to fly back to PNG and live in the elevated atmosphere of Ukarumpa in the Highlands. It will take her months to gain back the strength she lost though. We are so grateful for all the people (thousands of them) who prayed for her during this illness and for the staff at the Cairn’s hospital who gave her such excellent care and the Wycliffe clinic staff who knew when she needed to be evacuated. An image of Boaz in his bed. Our flight back was uneventful but not exactly comfortable. The 16-hour flight I once again managed without sleeping but did watch 3 more movies, including Hacksaw Ridge. The jet lag caught up with me and I crashed the day we drove back to Bella Vista. Boaz was so glad when we picked him up from the vet/kennel. He “talked” to us from the back seat. And he loved his bed and almost wouldn’t get up from it. It did take me a few days to recover, but overall I’m happy with the way my body handled that grueling trip. I know that one day I’ll be able to make it again for a happier reason. then, I’m going to upgrade that long flight to First Class and keep the long layovers down to decent times. This time, we just chose the flights that got us to Cairns the soonest. I’m going to see some more of that beautiful country and its people also. I weighed myself when I got back and was pleasantly surprised to see that my weight was 130.8. 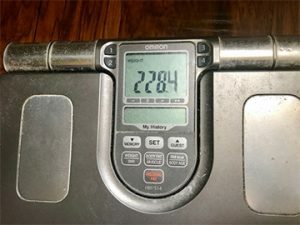 About what I weighed before I began my spiritual fast. So, between the 5 days of fasting and the few days of eating whatever I wanted, I didn’t do too bad. I’m now back on track with fasting on Mon-Wed-Friday and getting 1-2 meals on the other days and looks like I’m going to be heading fast toward reaching that new goal of 220 pounds now. I love this way of life – it works even during crises. Thanks for looking at my site and coming to this page. I would love for you to leave any questions or comments below. In addition, I’m open to new topics to research and comment on as they pertain to my own health and experience living with diabetes. 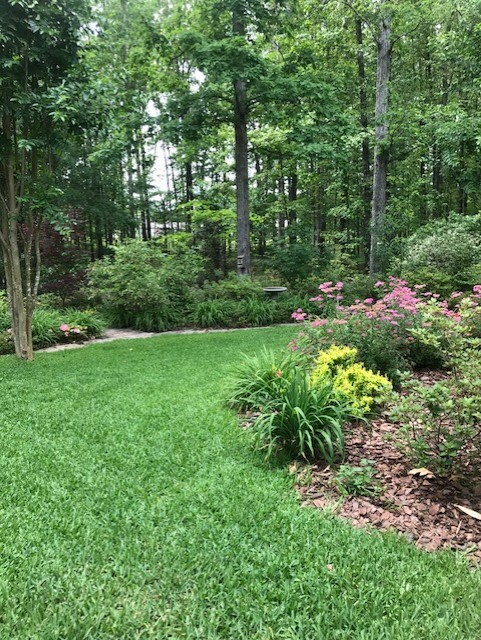 Please share your interests and questions in your comments. I also love to hear others stories about how they handle their own diabetes issues. 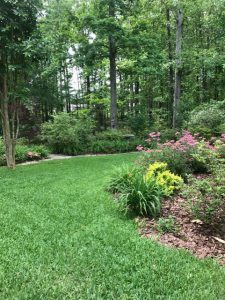 I will be sending out a monthly newsletter starting in July 2017. If you would like to receive that email newsletter, you can sign up here. Shirley, so thankful Jenn is recovering from that terrible illness! Everyone was so worried about her. I pray for her continued improvement every day. Btw- ask your endocrinologist about the medication Jardience. My doctor added that to the January that I take for Diabetes, and I have lost 22 pounds that I totally credit the medication for. It curbed my appetite a lot, and I haven’t changed what I eat, just how much! Just that I would pass that on! Thanks Cuz, we are so glad Jennifer is recovering It will be sometimes in July before they can fly back to Papua New Guinea and their mission work though. I’m actually working to get off all my diabetic meds. I’ve cut them in half since December and lost 30+ pounds doing my intermittent fasting and low carb eating. It’s working for me, plus my cholesterol and blood pressure are better too and my fibromyalgia pain is basically gone. I will read up on that Jardience drug though. Shirley, what a massive scare you all had to endure!! But I am glad to hear that it all had a happy ending for your daughter and her wonderful family, and for you guys. You must be a very strong willed lady to subject your body to such rigorous fasting diet. But I can understand how battling diabetes, or more so, making it a devoting sacrifice to see your daughter get better, are both powerful motivators. Well done Shirley, and please keep us updated with your journey through diabetes and with your daughter’s health.